Week 1 of Grand Prix complete. It wasn’t the result we were hoping for but we definitely gained a lot of valuable experience this past week. We arrived in Lima, Peru on (last) Monday evening and went straight to our hotel. The flight was going to be ok – it was only an 8hour flight (most of us have dealt with longer) but unfortunately no individual TV’s were provided. Good seats are always a dog fight to get, especially traveling with 14 VERY tall women, and an extremely tall coaching staff. Luckily I was texting Lucifer (Lucy / Lucille June) while our flight was still getting organized and she managed to snag 4 middle seats at the back of the plane for us, after fighting off a pack of men. I scuttled back there ASAP and had a pretty relaxed flight down to Lima – thank you, Lucifer. A few of us veterans have been to Lima a handful of times and it’s always a treat to stay at this hotel when we’re here – Delfines Hotel is amazing, the beds are lovely, Starbucks is across the street – it’s the dream. Initially when we heard that we needed to squeeze in 3 to a room for the first few nights, it was not well received. In our defence, some of us were just down in Mexico where they tried to squeeze a cot into an already tiny, tiny room with 2 ill-fitting longish twin beds. It’s safe to say we are just not into bunking 3 to a room. Grudgingly we went up to our random floors just ready to pass out from the 8hour flight – surprise! You’re in the suites! Pardon me? When does this ever happen for us. I’m sure some of you are thinking that a) you shouldn’t be that excited about a suite and b) who actually cares, but let me quickly change your mind. The doorbell (yes doorbell) rang to a “We Wish You a Merry Christmas” instrumental, opened to a massive living room / conjoining open space with 2 double beds, desk, lounge chairs, tv, multiple LAMPS (you’re welcome, Reese), and a bathroom, and THEN you could open a hidden door to the master bedroom. Master completed with its own living room; chairs, desks, tv, king bed, and a marble bathroom so large you can do cartwheels in (yes, I checked), jacuzzi tub, hidden laundry room, stand up shower, and a sauna. So yes, it’s THAT exciting. We had to move out on Thursday evening but the whole team definitely enjoyed the steams, bubble baths, and large robes for a few days while we could. 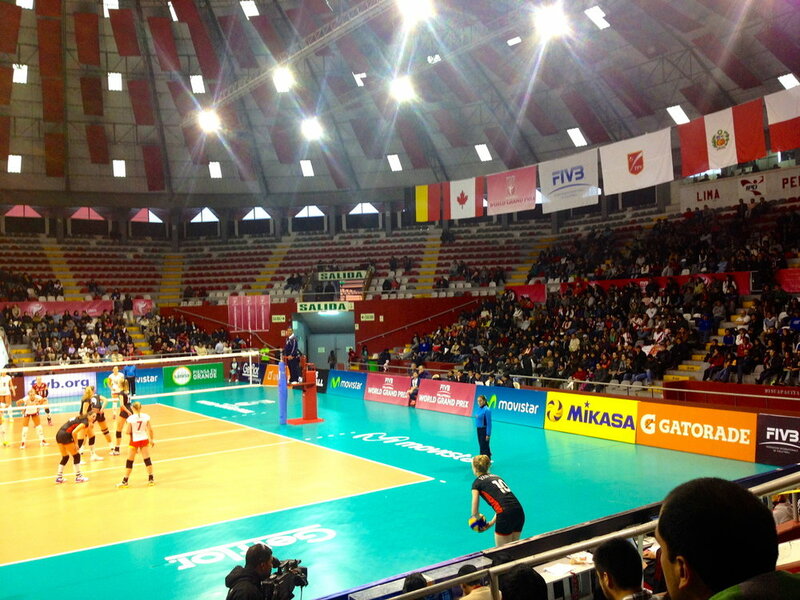 The first few days in Lima consisted of resting, light workouts, Starbucks, and practices. Once Friday FINALLY came along we were pumped and ready to play. First game started off with a bang as we were playing the home team, Peru, and they were fortunate enough to have home court advantage and their supportive, rowdy fans. 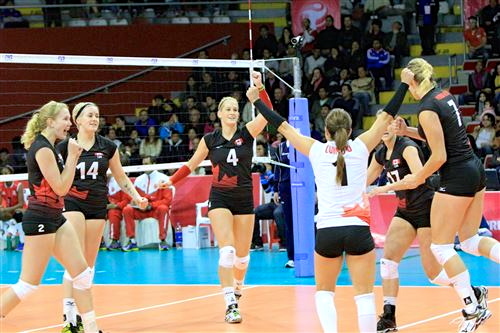 Earlier this summer at Pan Am Cup we had taken down Peru in 4 sets, also the first game of the tournament but we probably could have taken them down in 3. Unfortunately with the crowd behind them, Peru came out on fire and we couldn’t maintain our normal level of play against them. Regardless of the loss, it was a good experience for some to play in such an environment – we haven’t had that level of rambunctiousness from a crowd in a long time. After the game we stayed to watch a few sets of the Poland vs. Belgium match. During the game, I witnessed something very unfortunate that had me very concerned for the games to come; Poland’s libero was pooped on by a pigeon. Some of us had noticed the poop falling from the ceilings during our game, which, let me tell you, is somewhat distracting. You literally have things dropping all around you during the middle of the match. On the bench, it has turned into a game of whether or not you can spot the poop pelting to the ground. The pigeons are literally making it rain. Regardless, the libero handled it like a champion and after a little help from the volunteers who were in charge of mopping up the sweat marks, she was cleaned up and the game continued. The next day we played Poland who is a very solid team. We knew going into the match that their strengths would be their level of ball control and organization at the net. It also helps having a 6’7 middle blocker… but nobody’s counting. It took our team the first couple sets to find our groove and seemed to hit it in the third set when we started well from the beginning and kept the lead the whole game – as a result, we won 25-16. Unfortunately, they beat us in the 4th as we couldn’t hold them off in the middle of that set. We simply made too many errors and made it too easy for them. At this level, no team can afford to lose a string of points in a row because these top teams are going to take full advantage of that and make it hard for you to close that gap. We don’t get this chance very often to play against them so as long as we can learn what we need to do to be better and execute better, the results are going to come. One of our leftsides, Tabi Love, unfortunately didn’t travel with us to Europe and went home after Peru to be with our other teammates back in Winnipeg. However, we have added our passing libero, Tesca, to the roster and I am VERY excited that she has joined us. She didn’t initially travel with us because she was busy getting her wisdom teeth out (lucky her) but she’s back and ready to play – and has brought her extra energy with her! At the very beginning of last week (in Peru), Lupo was talking about the World Cup for soccer… shock! But he was mentioning the fact that Messi had won MVP of the tournament and when they asked one of the German players why he didn't get MVP his response was "we have the best 23". I feel that directly reflects on our team; we don't have one superstar we rely on. We're all having to do our jobs in order for our team to have success. It's going to be pretty crazy when we hit our stride. World, look out. I've also started up on Meet Your Team player profiles (Byron… be patient) and I'll be trying to post as many of those as I can. Becky Pavan is up next so check back in the next few days!! TEAM CANADA STRIVES FOR EXCELLENCE BY STANDING CONFIDENTLY WITH OUR GOALS IN MIND. WE MAKE CANADIANS PROUD WITH OUR COURAGE AND RESILIENCY IN TAKING THE NEXT STEP AND LEAVING BARRIERS BEHIND.